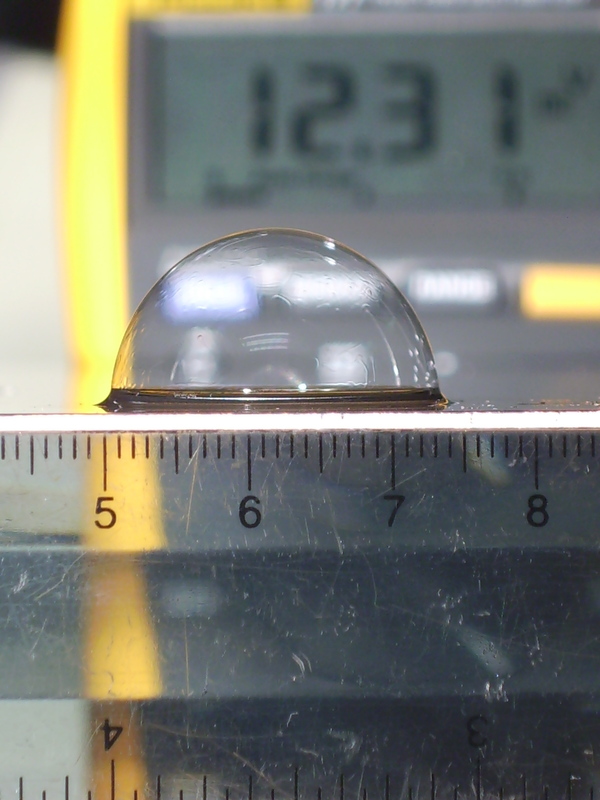 The project combined analysis and computation with modeling and simple experiments to see how an electrostatic field can alter the shape of a soap film or fluid membrane. Some appreciation that objects can experience a force when placed in an electrostatic field was around before 1752 when Benjamin Franklin used the idea in the invention of "Franklin's Bells". Various types of electroscope were invented soon after. A more quantitative understanding of how an electrostatic field can deform continuous media must have waited for formulation of the Maxwell stress tensor. Our project draws on studies by G.I. Taylor during the 1960's on liquid drops coalescing or breaking up in an electric field (cf. drops in a rain cloud) and the "Taylor cone", which is related to experiments by Zeleny (1917) on electrohydrodynamic "jetting". More recently, electrohydrodynamics has become a topic of interest for the control of a fluid, or of drops and bubbles, in small-scale microfluidic devices, and in solid-phase MEMS that have a variety of applications. The experimental setup we used is the same as that of the University of Delaware's MECLAB, and is seen in the two gray-scale photos below. Two aluminum plates (0.16 mm thick) are separated (5 cm apart) by threaded nylon bolts and nuts. The top plate has a central hole cut in it (10 cm diameter) across which a soap film is wiped. The plates are held at a potential difference of 0-20 kV using a standard adjustable low voltage power supply (0-20 V) which drives an Emco high voltage power supply (model F121, 10 Watts). The potential difference across the plates is measured by putting an Emco high voltage divider (model V1G) across them, which reduces the potential difference by 1000, and this reduced difference is measured by a standard digital multimeter. The multimeter can be seen in the photos, propped up behind the plates. Far more elaborate high voltage supplies are available, but this arrangement is cheap and fairly reliable. It has none of the safety features of more elaborate supplies, and it is fairly easy to get an electric shock at the high voltages used, but the amount of electric charge and current is very small. The Emco high voltage supply was often driven above its maximum 15 V input rating for minutes and did not fail. The main difficulty with our experiment was the setting up of a stable soap film. It would often burst before we could get results. This was probably due to the often low humidity of the air in the lab. We reviewed the modeling and analysis of the experimental setup that is given in the book "Modeling MEMS and NEMS" by John Pelesko (of the MECLAB) and David Bernstein. This was an invaluable starting point for the project. Because of the azimuthal symmetry, with some plausible modeling assumptions (plates and soap film are prefect conductors, no edge effects due to finite size of the plates, etc. ), the problem can be expressed as a two point boundary value problem for a second order nonlinear ODE. This needs numerical solution, and leads to a continuous branch of steady solutions (e.g., for maximum displacement of the film at its center versus applied voltage). The branch has a turning point - there is a maximum critical voltage above which there is no steady solution (and a film would burst). This gave us practice with the numerical solution of boundary value problems for ODEs, at tracking a branch of solutions, and trying to continue it around a turning point. Because of a symmetry property of this particular problem, it turns out that there is a much simpler method (which is explained in the book) for finding the solution branch. So we had this to compare to. Believing that we should do something that was not in the book, we reformulated the problem, relaxing an assumption that the deflection of the soap film is small. It gave us a second order ODE, which is the Laplace-Young equation or normal stress-balance modified to include electrostatic stress, for the film displacement. This ODE contains a few additional nonlinear terms together with the electric field strength at the film surface. The potential satisfies the Laplace equation of electrostatics between the plates and the film. So, we had Laplace's equation, a linear PDE, coupled to a nonlinear ODE to solve in order to find the (free boundary) position of the soap film. We used the free boundary position to map the physical domain below the film onto a fixed, rectangular geometry so as to simplify the numerical procedure. We compared the results of different numerical methods applied to the same model, and compared the predictions of our two models - for small-amplitude deflection and arbitrary-amplitude deflection. As anticipated, results of the small-amplitude and arbitrary-amplitude model diverged when the applied voltage and deflection amplitude were increased. We also used image processing software from the Matlab toolboxes to gather quantitative data from the experiments to compare with our model results. One component of this was estimation of the surface tension of our soap film mixture, for which we used data (i.e., the surface shape) of a pendant drop (on a 3.175 mm OD tube) taken from the photo below using much the same method as in a previous Capstone study, which you can find here. The model predictions were all in quite good agreement. The general trend in the experiments also agreed, but at the end of the project, when it came to comparing the experimental data with our model predictions point-by-point... the data fitted on the same page but were not that close at all. We came to the conclusion that we can put together a rough and ready experiment, but either we are are not good experimentalists, or we made a basic error somewhere which we could not find by the end of the 14-week semester. We reworked the experiments of "Axisymmetric shapes and stability of pendant and sessile drops in an electric field" by O.A. Basaran and L.E. Scriven. (Journal of Colloid and Interface Science, Vol. 140, 1990, pp 10-30.) We used the same apparatus as described above, and the soap film bubble is sessile (i.e., it sits on the lower plate). 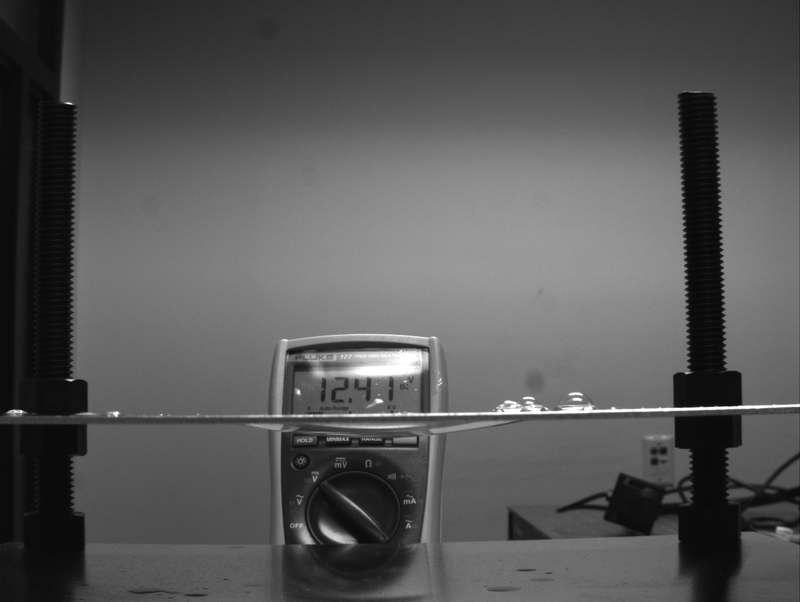 You see from the photos below, that as the applied potential difference between the plates increases from 12.31 kV (left) to 20.67 kV (right) the drop "sits up" due to the increase in induced charge on the film surface. Formulation of the governing equations proceeds as for the soap film, with the difference that there is now an additional volume constraint - the volume of air enclosed by the bubble is constant. 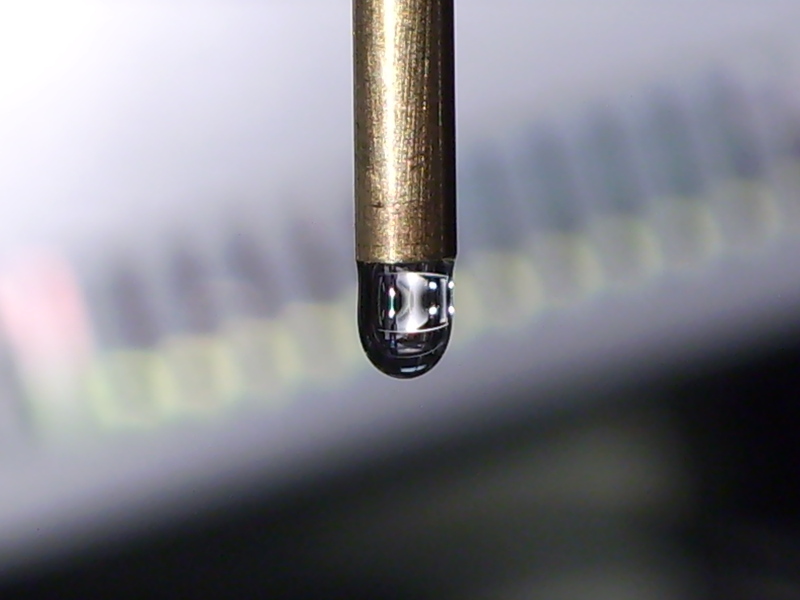 Also, the contact angle (i.e., the angle between the substrate and the bubble surface at the line of contact) needs to be prescribed, and here the substrate is wetted. The time-dependent behavior as the film or drop bursts is much more complicated. We made two videos that are linked below: (i) The progression of near steady-state shapes as the potential difference across the plates is increased, until the bubble bursts. (This is an asf file, about 7.4Mb.) (ii) Our first attempt with a high-speed camera - to capture the dynamics of bursting. (This is an avi file, about 10Mb.) 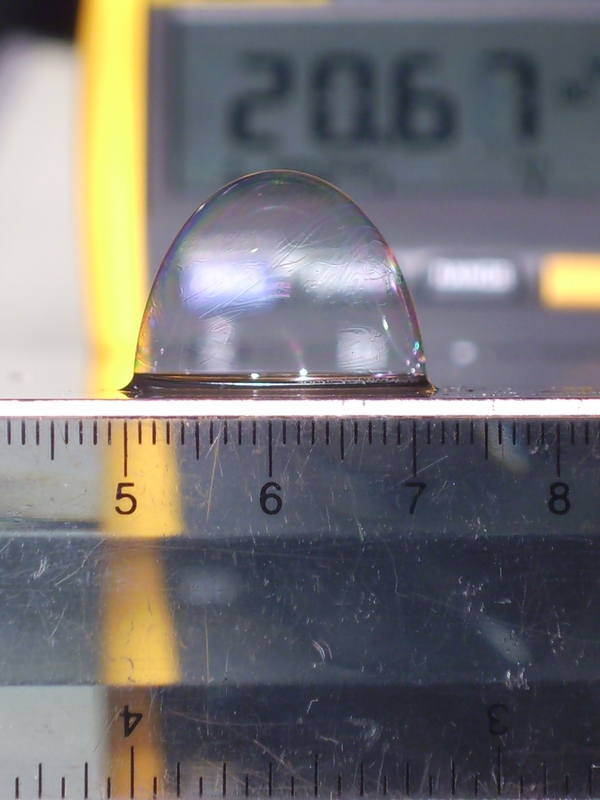 The video was taken at 1000 fps and plays back at 5 fps, so from beginning to end the burst and collapse of the soap film bubble lasts about 1/20 s.